In embryos, at 10 weeks of age, the surface of the fingertips is composed of undifferentiated epithelial cells that constitutes the nail field; at this stage, the matrix primordium consists of a wedge of basal-like cells that is growing proximally and diagonally into the deeper tissue of the phalanx at a point near the interphalangeal joint and that will continue to develop till newborn age or early infancy. In embryos, from 13 weeks up to 32 weeks, the lunula starts distally then proximally to differentiate from the more distal and older portions of the matrix primordium and produces the nail plate. The process of differentiation of the basal cells of the matrix consists of a flattening of the cells, a fragmentation of the nuclei, a condensation of the cytoplasm to form horny cells strongly adherent to one another. In contrast with what is observed in the hair, the cell membranes are prominent in the final horny layer. The region of fragmentation of nuclei and cytoplasm condensation is named keratogenous zone. The area extends from the lunula to the hyponychium. In the adults, it does not contribute to the nail plate, with the exception of few horny cells adherent to the ventral face of the nail plate. The nail bed epidermis differentiates vertically and there are no keratohyalin granules in the adults while they are present in the embryos until 17 to 20 weeks of development; they disappear with covering of the nail bed by the growing nail plate. 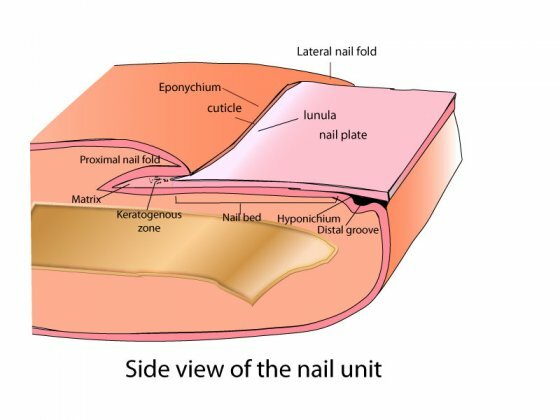 The hyponichium is the portion of the epidermis under the free edge of the nail which extends from the nail bed to the distal groove. It constitutes a seal that protects the nail bed. Its differentiation process is like in the epidermis elsewhere with a granular layer containing abundant keratohyaline granules. The onychodermal band is the seal found under the free edge, between the nail plate and the hyponychium, where the nail bed ends. The proximal nail fold is composed of two layers of epidermis; the dorsal layer constitutes the dorsum of the finger epidermis and the ventral layer overlies the newly formed nail plate. They differentiate as the epidermis elsewhere; the horny layer of the ventral portion is adherent to the surface of the newly formed nail plate and moves distally. 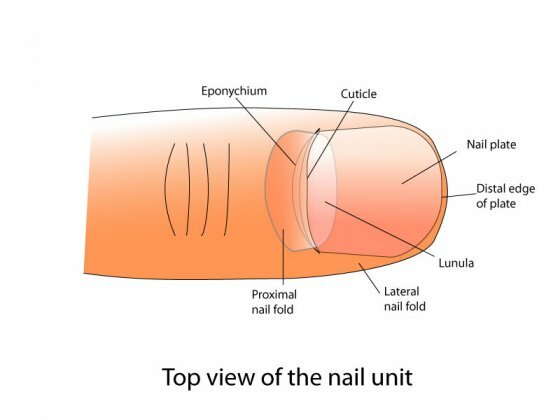 The eponychium is a small band of living epithelium that extend from the proximal nail wall onto the base of the nail. It is the end of the proximal fold that sheds a non living almost invisible epidermal layer, named the cuticle which forms with the eponychium a protective seal at the proximal part of the nail plate. The nail plate is composed primarily of proteins, mainly fibrous keratins consisting of both epidermal and hair keratins, the latter comprising more than 90% of the total. The keratin filaments lie parallel to the surface of the nail and are oriented in a direction parallel to the growth of the nail. The lipid content of the nail plate is less than 5%. The nail has a very porous structure. The diffusion constant for water in the nail is 100 times that of epidermis and the nail is rapidly hydrated with water. en STRUCTURE AND FUNCTIONS Normal human skin structure Epidermis Epidermal appendages Nails ?